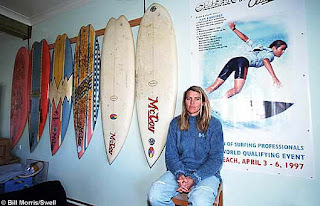 : Board Collector: Three of the most important surfboards of the innovation period. Three of the most important surfboards of the innovation period. 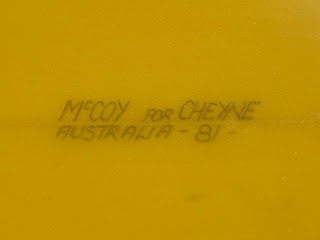 An anonymous Australian collector has contacted me with pics of a couple of his boards, that are in my opinion, some of the most important and collectible surfboards from the innovation period of surfboard design. 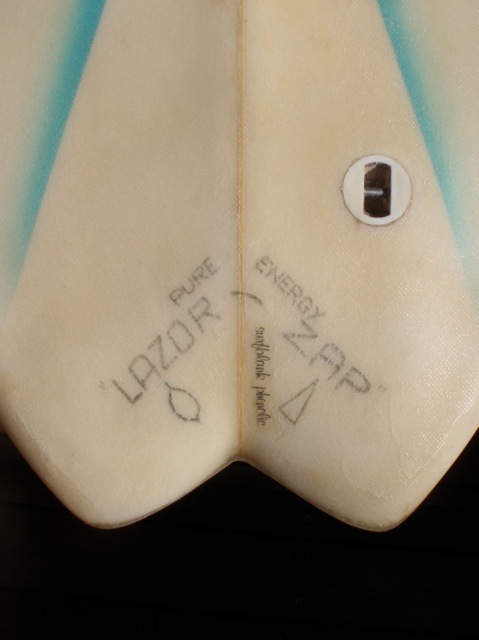 The first is an extreme version of the no nose concept and was possibly the very first Lazor Zap design by Geoff McCoy. I have read that the Lazor Zap shape and name came to Geoff in a dream and seeing this extreme early version of the design I can certainly belive that. This board is certainly one of the most important modern boards in the world from a design view point. 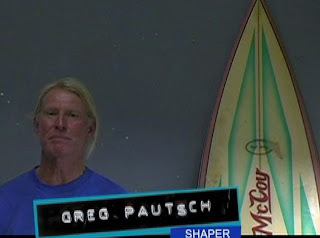 Greg Pautsch from McCoy USA is shown with a similar extreme 'no nose' design in Jeff Parker's Echo Beach. The second board he has in his collection is one of the most photographed and recognised from the innovation period. Another Geoff McCoy shape from 1981 that was ridden around the world at the height of Cheyne Horan's fame, success and influence. 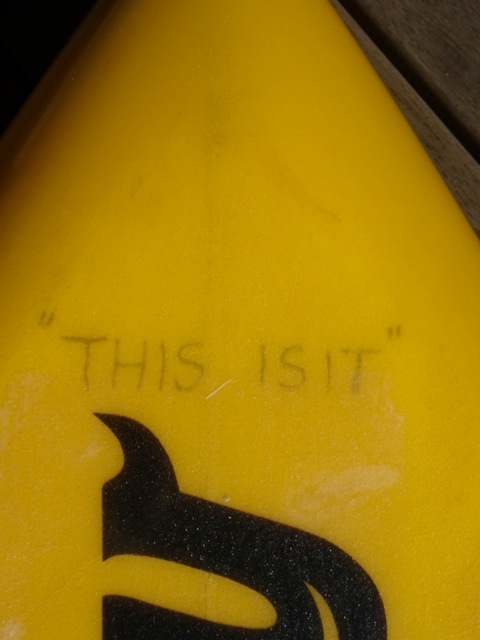 "THIS IS IT" written on the nose is, I'm told, in referencce to the one going experimentstion and tweaking that Geoff and Cheyne were doing with the design. 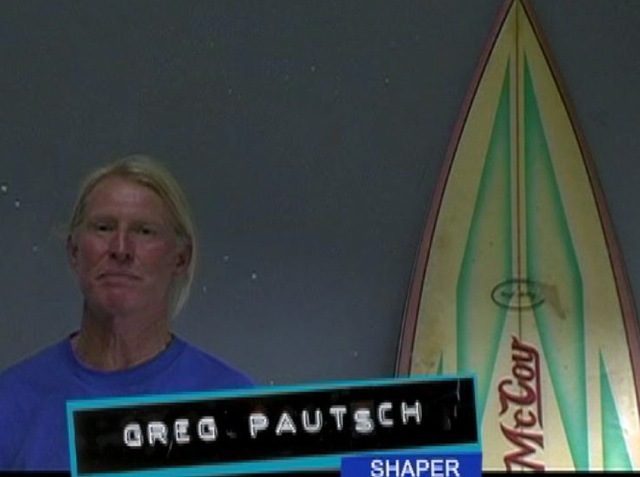 The third board he has is one of Pam Burridge's competition Lazor Zaps with original boomerang fin. He is looking to sell all three as a set to the right collector. I only know of three serious collectors and two museams who would understand the value and importance of these pieces. 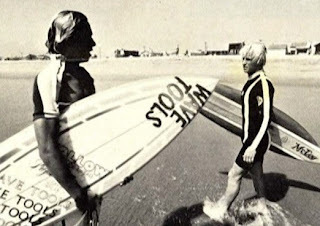 You can write to me at damion@boardcollector.com and I will pass on your 5 figure offer or question.